Mary-Ann Ochota: what does the BMC mean to you? Globe-trotting archaeologist turned adventurer Mary-Ann Ochota explains why it's important to vote in the upcoming BMC AGM. It’s fair to say Mary-Ann has a diverse CV. Among other things, she has studied at Cambridge, been quizzed on University Challenge, been a model for Special K and presented Time Team. She’s also a keen outdoor enthusiast who has walked and bivvied across Britain, often accompanied by her loping pet Labrador. Last year she presented the five-part Great Walks series on BMC TV. It’s fantastic that the BMC are reaching out to the huge community of people who love walking in our hills and high places. The mountains are for everyone, and I’m honoured to be asked to do my bit to get that message out there. The BMC is a membership organisation that brings people together, united by their love of climbing, mountaineering and walking. It’s also a resource for training, skills and campaigns to help protect and preserve our mountain landscapes and people’s access to them. It’ll also be instrumental in helping introduce climbing to a wider public in 2020 with the Olympics. The BMC is a broad church – both its strength and its challenges lie in this fact. Someone who competes in indoor climbing competitions might not share that much with someone who goes hill-walking on a weekend for pleasure. The reasons we join might be very similar, very different, or somewhere in the middle, but the thing that unite us is that a strong and competent BMC benefits everyone. United, our voices are heard in the corridors of power, the projects that are important to us get funded, and we can carry on enjoying our passions – whether that’s at the end of a colourful rope or up a Munro. I don’t want to get stuck in the nitty gritty of how the organisation works, I just want to know that it’s doing a good job. AGMs aren’t always top of my excitement list, and there’s been more than the average number of structural-organisational-constitutional amendments, surveys and reviews dropping into my inbox over the past year. Despite the fatigue, this time it’s really important. The BMC needs to vote in a new constitution at the coming AGM. There are two options for the changes, A or B. And the ‘winning’ option needs 75% of the vote in order to be passed. Option A means the BMC can access Sport England funding, carry on as the national body for climbing and represent and support all the partner organisations like Mountain Training with funding and a united and professional voice. Personally, as a hillwalker, I’ve benefitted from the information available on BMC TV, from skills courses and the partnership with Mountain Training, the Mend Our Mountains campaign, and the work of the Equity Officer. These things were all possible because of Sport England cash. The funding landscape might change in the future, but we shouldn’t burn bridges to money that could be ours if we structure the BMC right. I can see why some people think we shouldn’t bother jumping through the compliance hoops required to qualify for Sport England funding. But I don’t think having a rigorous structure, organisational transparency and best-practice compliance is at odds with the members’ interests. It’ll help make the BMC work and act professionally and our sports be taken seriously. I think if we’re going to sort out the BMC, we should do it in a way that makes it fit for purpose for a generation. Let’s get it sorted, allow our sports to benefit from any national funding that they can, and allow the volunteers and staff to get back to running the comps, working for equality and diversity, access, conservation and all the other good stuff. If you can’t get to the AGM to vote in person, you can vote online. You have until 1pm on Thursday 14 June to have your say. It’ll take a few minutes to read the options and vote. Do it. This is an article promoting Option A. 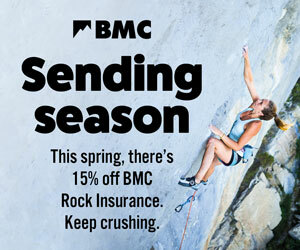 The recommended option from the BMC National Council (supported by the Organisational Review Group, BMC Board of Directors and BMC staff) and Mountain Training. The award-winning, headline-grabbing campaign which raised more than £100,000 to repair Britain’s hills and mountains has returned – and is raising its sights ten times higher.